- Massive Dynamic leads the way in creating longer, healthier, happier lives. Our [[MD Microlaser|microlaser surgical tools]] can be found in over 12,000 hospitals worldwide alongside our acclaimed [[MD Scanners|magnetophotonic MRIs and QIP scanners]]. [[MD HealthRemote|HealthRemote]], our patented health monitoring system, has helped thousands of patients return to their homes and workplaces, while remaining under physician care. + Massive Dynamic leads the way in creating longer, healthier, happier lives. Our [[MD Microlaser|microlaser surgical tools]] can be found in over 12,000 hospitals worldwide – alongside our acclaimed [[MD Scanners|magnetophotonic MRIs and QIP scanners]]. [[MD HealthRemote|HealthRemote]], our patented health monitoring system, has helped thousands of patients return to their homes and workplaces, while remaining under physician care. - But its not enough for us to care about you you need to care about you! And MD can help. The [[RealMe]] product line, designed by our [[ExtensaLife]] subsidiary, gives you the psychological, pharmaceutical, and technological tools to change yourself from the inside out to become who you want to become. + But it’s not enough for us to care about you… you need to care about you! And MD can help. The [[RealMe]] product line, designed by our [[ExtensaLife]] subsidiary, gives you the psychological, pharmaceutical, and technological tools to change yourself from the inside out… to become who you want to become. The Information Age is over... but the Integration Age has only just begun. Computing is woven into the fabric of our lives, as vital to our civilization as food, shelter, and clothing. Already, MD [[MD Quantum Networking|Quantum-Digital Networking]] plays a vital role in the intelligence centers of our world, streamlining the operations of governments, firms, households, and recreational zones. The Information Age is over... but the Integration Age has only just begun. Computing is woven into the fabric of our lives, as vital to our civilization as food, shelter, and clothing. Already, MD [[MD Quantum Networking|Quantum-Digital Networking]] plays a vital role in the intelligence centers of our world, streamlining the operations of governments, firms, households, and recreational zones. - [[Massive Logistic]], MDs information technology subsidiary, leads the world in innovative hardware and software design. From artificial intelligence to bio-computation, Massive Logistic is there, easing the way as humanity moves toward a brighter, faster, smarter, and more dynamic world. The next stage will be leveraging [[MD D2O|D2O (digital-to-organic) convergence]] to improve service delivery to the average consumer meeting your needs as quickly as you realize them. + [[Massive Logistic]], MD’s information technology subsidiary, leads the world in innovative hardware and software design. From artificial intelligence to bio-computation, Massive Logistic is there, easing the way as humanity moves toward a brighter, faster, smarter, and more dynamic world. The next stage will be leveraging [[MD D2O|D2O (digital-to-organic) convergence]] to improve service delivery to the average consumer – meeting your needs as quickly as you realize them. - Earth is the only home we have at least for now. And its our job to take care of it. [[Massive Energetic]], our energy development team, partners with local communities to meet their unique sustainability needs. Our membranoscopic water reclamation project brings fresh, clean water to the worlds neediest people, shielding them from pollutants both natural and man-made. + Earth is the only home we have – at least for now. And it’s our job to take care of it. [[Massive Energetic]], our energy development team, partners with local communities to meet their unique sustainability needs. Our membranoscopic water reclamation project brings fresh, clean water to the world’s neediest people, shielding them from pollutants both natural and man-made. At Massive Dynamic, the future is a bright shade of green. From zero-point energy extraction to hydrogen-to-helium conversion, the Massive Dynamic Energy Group will continue to lead the world in designing better, cleaner technologies for an ever-changing world. At Massive Dynamic, the future is a bright shade of green. From zero-point energy extraction to hydrogen-to-helium conversion, the Massive Dynamic Energy Group will continue to lead the world in designing better, cleaner technologies for an ever-changing world. Does your life need an upgrade? At Massive Dynamic, we know how tedious life can be. [[Ludic Science]], our entertainment division, has developed a stunning array of innovative products to fill the void inside with adventure, excitement, and passion. The [[D20 Z10|Mass-Dyn Z10 video game system]] has brought the experience of immersive gaming to young and old alike, while our [[MD Giga-Def|Giga-Def]] television technology has been installed in government agencies and corporate offices worldwide. Does your life need an upgrade? At Massive Dynamic, we know how tedious life can be. [[Ludic Science]], our entertainment division, has developed a stunning array of innovative products to fill the void inside with adventure, excitement, and passion. The [[D20 Z10|Mass-Dyn Z10 video game system]] has brought the experience of immersive gaming to young and old alike, while our [[MD Giga-Def|Giga-Def]] television technology has been installed in government agencies and corporate offices worldwide. - And thats just the beginning. As Full-Sensory-Input technology advances, it will progressively erase the line between virtual and real, bringing you ever closer to a life beyond your dreams. + And that’s just the beginning. As Full-Sensory-Input technology advances, it will progressively erase the line between virtual and real, bringing you ever closer to a life beyond your dreams. * Some travel maybe required. * Some travel maybe required. - * Masters degree in Computer Science or minimum 8 years IT experience. + * Master’s degree in Computer Science or minimum 8 years IT experience. * Working knowledge of binary-quaternary language translation. * Working knowledge of binary-quaternary language translation. * Familiarity with multiple operating systems and cross-platform transitions. * Familiarity with multiple operating systems and cross-platform transitions. * Perform valuation analysis for projects and companies, and prepare full financial models for project valuation. * Perform valuation analysis for projects and companies, and prepare full financial models for project valuation. * Conduct financial modeling to determine operating performance and assess risk. * Conduct financial modeling to determine operating performance and assess risk. - * Develop strategies to mitigate ongoing risk, including biological, environmental, quantum mechanical, and legal/regulatory threats to MDs profitability. + * Develop strategies to mitigate ongoing risk, including biological, environmental, quantum mechanical, and legal/regulatory threats to MD’s profitability. * MBA Degree with 6+ years experience in finance or banking industry with exposure to large commercial transaction underwriting. * MBA Degree with 6+ years experience in finance or banking industry with exposure to large commercial transaction underwriting. But you don't have to be a genius to work at Massive Dynamic - just committed to our core values of quality workmanship, technological progress, and community service. But you don't have to be a genius to work at Massive Dynamic - just committed to our core values of quality workmanship, technological progress, and community service. - Massive Dynamic Team Members enjoy the very best in compensation, benefits, and amenities. As a result, they are some of the most devoted employees in the world. In addition to the standard amenities, our worldwide offices boast five-star restaurants, on-site recreation and swimming facilities, daycare and child development programs, cosmetic centers, yoga and tai chi classes, dental offices, and more. In the future, we plan to add even more facilities, such as auto-hypnosis rooms, revitalization lounges, and detoxification bars. Were proud to say that people who come to work at Massive Dynamic never want to leave. + Massive Dynamic Team Members enjoy the very best in compensation, benefits, and amenities. As a result, they are some of the most devoted employees in the world. In addition to the standard amenities, our worldwide offices boast five-star restaurants, on-site recreation and swimming facilities, daycare and child development programs, cosmetic centers, yoga and tai chi classes, dental offices, and more. In the future, we plan to add even more facilities, such as auto-hypnosis rooms, revitalization lounges, and detoxification bars. We’re proud to say that people who come to work at Massive Dynamic never want to leave. Our health insurance plans are unmatched in the Fortune 500, with benefits ranging from traditional treatment to mental health to Eastern medicine. In addition, MD employees have privileged access to cutting-edge wellness programs that contribute to the health of both body and mind. A healthy employee is a happy employee. Our health insurance plans are unmatched in the Fortune 500, with benefits ranging from traditional treatment to mental health to Eastern medicine. In addition, MD employees have privileged access to cutting-edge wellness programs that contribute to the health of both body and mind. A healthy employee is a happy employee. - In 1992, after years of hard work and research, [[William Bell]] had finally succeeded in the creating the biomedical marvel that would change the face of medicine and assure his place in science history. His prototype nanoelectronic circuit enabled the translation of neural impulses into electronic data, a major breakthrough in moveable prosthetics. Bell decided the time had come to found a company that would, as he put it, satisfy the technological needs of this century and the next. With the backing of a small group of investors, [[BellMedics|BELLMEDICS]] was born. + In 1992, after years of hard work and research, [[William Bell]] had finally succeeded in the creating the biomedical marvel that would change the face of medicine and assure his place in science history. His prototype nanoelectronic circuit enabled the translation of neural impulses into electronic data, a major breakthrough in moveable prosthetics. Bell decided the time had come to found a company that would, as he put it, “satisfy the technological needs of this century and the next.” With the backing of a small group of investors, [[BellMedics|BELLMEDICS]] was born. Bell's contribution to prosthetics couldn't have come at a better time. The Persian Gulf War had just concluded, and BELLMEDICS gave hope to soldiers who had lost limbs in the conflict. With the support of Defense Department grants, Bell's circuit laid the foundation for a revolution in prosthetics that continues to this day. Bell's contribution to prosthetics couldn't have come at a better time. The Persian Gulf War had just concluded, and BELLMEDICS gave hope to soldiers who had lost limbs in the conflict. With the support of Defense Department grants, Bell's circuit laid the foundation for a revolution in prosthetics that continues to this day. In 2002, on the 10th anniversary of its founding, Massive Dynamic leapt into the world of computing and telecommunications. Massive Dynamic's [[MD Q-Security|Q-Security]] was widely hailed as a superior, seamless networking tool for governments, firms, and households. MD's Computing and Communications branch grew dramatically, particularly in the fields of artificial intelligence, bio-computation and quantum cryptography. In 2002, on the 10th anniversary of its founding, Massive Dynamic leapt into the world of computing and telecommunications. Massive Dynamic's [[MD Q-Security|Q-Security]] was widely hailed as a superior, seamless networking tool for governments, firms, and households. MD's Computing and Communications branch grew dramatically, particularly in the fields of artificial intelligence, bio-computation and quantum cryptography. - Two years later, Massive Dynamic burst into the world of entertainment. By 2007, [[Ludic Science]] MD's entertainment subsidiary had designed digital effects software now used by every major film studio. Meanwhile, the Mass-Dyn [[MD Z10|Z10 videogame console]] became an overnight hit with children and adults alike, while [[MD Giga-Def|Giga-Def Televisions]] took their place in millions of homes around the world. + Two years later, Massive Dynamic burst into the world of entertainment. By 2007, [[Ludic Science]] – MD's entertainment subsidiary – had designed digital effects software now used by every major film studio. Meanwhile, the Mass-Dyn [[MD Z10|Z10 videogame console]] became an overnight hit with children and adults alike, while [[MD Giga-Def|Giga-Def Televisions]] took their place in millions of homes around the world. Today, Massive Dynamic is a multi-faceted corporation working for the betterment of medical, communications, energy, transportation, and entertainment technology. As humanity moves boldly into the future, Massive Dynamic will be there leading the way, improving the quality of life for people everywhere. Today, Massive Dynamic is a multi-faceted corporation working for the betterment of medical, communications, energy, transportation, and entertainment technology. As humanity moves boldly into the future, Massive Dynamic will be there leading the way, improving the quality of life for people everywhere. - As human civilization approaches the technological singularity, education in math and science will become ever more important. Massive Dynamic is committed to the education of the worlds next generation of biotechnologists, geo-engineers, and neuroprogrammers through our preschool motivational series, primary and secondary enrichment programs, and summer science seminars. + As human civilization approaches the technological singularity, education in math and science will become ever more important. Massive Dynamic is committed to the education of the world’s next generation of biotechnologists, geo-engineers, and neuroprogrammers through our preschool motivational series, primary and secondary enrichment programs, and summer science seminars. - Humanitys growing demand for energy calls for serious research into remote possibilities. Zero-point energy extraction the employment of energy contained in a quantum vacuum holds out the promise of a cheap, clean power source that will make fossil fuels obsolete. Despite the skeptics, Massive Dynamic physicists continue to explore the next frontier in power production, in the hope of creating a greener, more efficient future. + Humanity’s growing demand for energy calls for serious research into remote possibilities. Zero-point energy extraction – the employment of energy contained in a quantum vacuum – holds out the promise of a cheap, clean power source that will make fossil fuels obsolete. Despite the skeptics, Massive Dynamic physicists continue to explore the next frontier in power production, in the hope of creating a greener, more efficient future. - As climate change progresses and sea levels gradually rise, coastal regions around the world will face mounting difficulties. Some stretches of land may be lost to humanity forever. Massive Dynamics [[Coastal Protection Project]] aims to protect coastal areas with advanced technologies including artificial reef construction, sea current rerouting, and hydraulic reclamation. With the right strategies, we can help our beaches resist the rising tide. + As climate change progresses and sea levels gradually rise, coastal regions around the world will face mounting difficulties. Some stretches of land may be lost to humanity forever. Massive Dynamic’s [[Coastal Protection Project]] aims to protect coastal areas with advanced technologies including artificial reef construction, sea current rerouting, and hydraulic reclamation. With the right strategies, we can help our beaches resist the rising tide. - Did you ever have an idea to help your fellow man, but you didnt know where to start? Or maybe you thought your idea to solve a problem was too big for you to try alone. Massive Dynamic believes the best ideas originate from the ground up with individuals and communities that want to make a difference. That is why we established the [[Volunteerism Fund]]. We provide the start-up funding and trained staff of volunteer experts to help make your plan a reality. At Massive Dynamic, we want to help you help others. + Did you ever have an idea to help your fellow man, but you didn’t know where to start? Or maybe you thought your idea to solve a problem was too big for you to try alone. Massive Dynamic believes the best ideas originate from the ground up with individuals and communities that want to make a difference. That is why we established the [[Volunteerism Fund]]. We provide the start-up funding and trained staff of volunteer experts to help make your plan a reality. At Massive Dynamic, we want to help you help others. - As many as half of all birth defects and congenital diseases could be prevented through careful and consistent genetic screening of parents. Sadly, genetic screening remains out of reach for many of the worlds neediest people. Massive Dynamics [[Genetic Screening Fund]] aims to reduce infant mortality and morbidity by bringing high-quality genetic testing to every country and continent on the basis of need, not ability to pay. + As many as half of all birth defects and congenital diseases could be prevented through careful and consistent genetic screening of parents. Sadly, genetic screening remains out of reach for many of the world’s neediest people. Massive Dynamic’s [[Genetic Screening Fund]] aims to reduce infant mortality and morbidity by bringing high-quality genetic testing to every country and continent – on the basis of need, not ability to pay. - Waistlines are expanding, and more elastic is not the solution. Childhood obesity is more prevalent than ever before. Massive Dynamics [[Better Bodies Initiative]] aims to fight the growing trend with nutrition education, community exercise teams, obesity diagnosis centers, and free access to our [[RealMe]] product line. Massive Dynamic is committed to helping you become healthier and happier. + Waistlines are expanding, and more elastic is not the solution. Childhood obesity is more prevalent than ever before. Massive Dynamic’s [[Better Bodies Initiative]] aims to fight the growing trend – with nutrition education, community exercise teams, obesity diagnosis centers, and free access to our [[RealMe]] product line. Massive Dynamic is committed to helping you become healthier… and happier. - When a humanitarian crisis strikes, its not enough to send food and supplies to needy people. Without a team of trained and trusted volunteers on the ground to supervise relief, most help goes wasted. Massive Dynamic has trained [[MD CMT|Crisis Management Teams]] that accompany all our disaster relief materials into the affected areas. When we send out a helping hand, we want to make sure it finds those most in need. + When a humanitarian crisis strikes, it’s not enough to send food and supplies to needy people. Without a team of trained and trusted volunteers on the ground to supervise relief, most help goes wasted. Massive Dynamic has trained [[MD CMT|Crisis Management Teams]] that accompany all our disaster relief materials into the affected areas. When we send out a helping hand, we want to make sure it finds those most in need. - Welcome to the Massive Dynamic web site at massivedynamic.com (Site). This Site is owned and operated by the Massive Dynamic corporation (MD). MD is a global entity providing products and services to people on every continent. + Welcome to the Massive Dynamic web site at massivedynamic.com (Site). This Site is owned and operated by the Massive Dynamic corporation (“MD”). MD is a global entity providing products and services to people on every continent. Materials on this Site are owned by MD. This Site may also include materials owned by third parties and posted on this Site by virtue of a license, grant, or other form of agreement between the third party and MD. Materials on this Site are owned by MD. This Site may also include materials owned by third parties and posted on this Site by virtue of a license, grant, or other form of agreement between the third party and MD. While MD does its best to ensure the optimal performance of this Site, you agree that you use this Site and rely on material contained in this Site at your own risk. While MD does its best to ensure the optimal performance of this Site, you agree that you use this Site and rely on material contained in this Site at your own risk. - You acknowledge that MD and its affiliates and subsidiaries together with their respective officers, directors, <span class="plainlinks">[http://tinyurl.com/64zn3j6 <span style="color:black;font-weight:normal;text-decoration:none!important;background:none!important; text-decoration:none;">psychics</span>]</span> agents, employees, and shareholders, are not liable for any failures, delays, inaccuracies, omissions, errors, interruptions, defects, deletions, viruses, communication line failures, natural disasters, or acts of God, or for the theft, destruction, damage or unauthorized access to your computer system or network. + You acknowledge that MD and its affiliates and subsidiaries together with their respective officers, directors, agents, employees, and shareholders, are not liable for any failures, delays, inaccuracies, omissions, errors, interruptions, defects, deletions, viruses, communication line failures, natural disasters, or acts of God, or for the theft, destruction, damage or unauthorized access to your computer system or network. This Site, and all materials in this Site, are provided "as is" and, to the fullest extent permitted by law, are provided without warranties of any kind either express or implied. This means, without limitation, that MD does not warrant that this Site is fit for any particular purpose; that the functions contained in the materials in this Site will be uninterrupted; that defects will be corrected; or that this Site will be error free or reliable. This Site, and all materials in this Site, are provided "as is" and, to the fullest extent permitted by law, are provided without warranties of any kind either express or implied. This means, without limitation, that MD does not warrant that this Site is fit for any particular purpose; that the functions contained in the materials in this Site will be uninterrupted; that defects will be corrected; or that this Site will be error free or reliable. - You may choose to provide personal information (such as your name, address, telephone number, and email address) on this Site. If you email MD through the Contact Us link on this Site, MD will ask you for information such as your name and email address so MD can respond to your questions and comments. You may choose to provide additional information as well. In providing such information to MD, you thereby give MD permission to use said information in any manner that MD sees fit. + You may choose to provide personal information (such as your name, address, telephone number, and email address) on this Site. If you email MD through the “Contact Us” link on this Site, MD will ask you for information such as your name and email address so MD can respond to your questions and comments. You may choose to provide additional information as well. In providing such information to MD, you thereby give MD permission to use said information in any manner that MD sees fit. The site was launched the night of the premiere of Fringe on Fox. It has a clean-cut, soothing interface, and seems to be in keeping with the general feel of the MD building. It includes links to short descriptive pages about MD's various services as well as some basic information pages. Time spent in transit is time wasted. Time you could have spent with family, friends, and co-workers. Because Massive Dynamic values your time, our mandate is to get you where you're going -- safer and faster than ever before. The acclaimed PEARL aerocontrol system, developed by MD's Fleming-Monroe division, promises to reduce flight delays by as much as 30% in the next few years. Meanwhile, our zero-friction light rails and flex-hull container ships promise to revolutionize commercial transport. What's next? Travel time follows a power law, decreasing by a given factor year by year. MD's Zeno-Transit Initiative aims to take that process to the limit, making near-instantaneous travel a reality in your lifetime. "I helped design MD's flexible-hull container ships, which reduced transoceanic transport times by eleven percent." Massive Dynamic leads the way in creating longer, healthier, happier lives. Our microlaser surgical tools can be found in over 12,000 hospitals worldwide – alongside our acclaimed magnetophotonic MRIs and QIP scanners. HealthRemote, our patented health monitoring system, has helped thousands of patients return to their homes and workplaces, while remaining under physician care. But it’s not enough for us to care about you… you need to care about you! And MD can help. The RealMe product line, designed by our ExtensaLife subsidiary, gives you the psychological, pharmaceutical, and technological tools to change yourself from the inside out… to become who you want to become. "MASSIVE DYNAMIC's prenatal therapies cured my daughter before she was even born." The Information Age is over... but the Integration Age has only just begun. Computing is woven into the fabric of our lives, as vital to our civilization as food, shelter, and clothing. Already, MD Quantum-Digital Networking plays a vital role in the intelligence centers of our world, streamlining the operations of governments, firms, households, and recreational zones. Massive Logistic, MD’s information technology subsidiary, leads the world in innovative hardware and software design. From artificial intelligence to bio-computation, Massive Logistic is there, easing the way as humanity moves toward a brighter, faster, smarter, and more dynamic world. The next stage will be leveraging D2O (digital-to-organic) convergence to improve service delivery to the average consumer – meeting your needs as quickly as you realize them. "When the Styx Worm attacked our network, MASSIVE DYNAMIC's Q-Security Protocol fought back - and won." Earth is the only home we have – at least for now. And it’s our job to take care of it. Massive Energetic, our energy development team, partners with local communities to meet their unique sustainability needs. Our membranoscopic water reclamation project brings fresh, clean water to the world’s neediest people, shielding them from pollutants both natural and man-made. At Massive Dynamic, the future is a bright shade of green. From zero-point energy extraction to hydrogen-to-helium conversion, the Massive Dynamic Energy Group will continue to lead the world in designing better, cleaner technologies for an ever-changing world. "This entire plant is powered by MASSIVE DYNAMIC wind-solar generators. That's good for the planet and the bottom line." Does your life need an upgrade? At Massive Dynamic, we know how tedious life can be. Ludic Science, our entertainment division, has developed a stunning array of innovative products to fill the void inside with adventure, excitement, and passion. The Mass-Dyn Z10 video game system has brought the experience of immersive gaming to young and old alike, while our Giga-Def television technology has been installed in government agencies and corporate offices worldwide. And that’s just the beginning. As Full-Sensory-Input technology advances, it will progressively erase the line between virtual and real, bringing you ever closer to a life beyond your dreams. Large Hadron Collider goes live Sept, 10th. Largest particle collider in history will advance knowledge of universe's birth. Scientists decipher protein critical for growth of tumors. Discovery holds promise of better cancer treatments. Philanthropists donate $400 million to genetic research. Eli and Edyth Broad's gift could lead to new treatments and better diagnoses for rare diseases. Nina Sharp congratulates Massive Dynamic employees who medaled in Beijing 2008 Olympics. MD Bridge Club takes 1st place in New York Bridge Invitational for fourth year running. MD Biological/Medical has completed move to new research facility in Cambridge, U.K., where stem cell research will take front billing. MD Quantum Computing center has achieved performance of 1.0 petaflop/sec in initial trials. Follow-up trials to begin mid-September. Massive Energetic thanks the MD family for its support during rescue of Antarctic field survey team. All team members are present and accounted for! Robot assists surgeons in tricky procedures. This new device tracks the surgeons' eye movements to provide an extra set of hands. Large Hadron Collider shut down until spring 2009. A helium leak forced the collider to shut before before any proton collision occurred. DNA Research Could Allow Resurrection of Extinct Tortoise. The breeding program would use genes of extant tortoise species. Massive Dynamic congratulates NASA on its 50th birthday, and looks forward to working closely for the next 50, here on Earth and beyond. Two researchers from Massive Dynamic are named 2008 MacArthur Fellows. Keep up the good work, "genius" prize winners! MD Biological & Medical division thanks Elias Zerhouni for all the excellent work during his tenure as head of the National Institutes of Health. We are grateful for all your feedback. Responsibilities: Conduct research on cutting-edge technology in the field of biosciences area. Work in a multidisciplinary environment in conjunction with computer scientists, statisticians, engineers, and medical doctors to develop new products and technologies to support the advanced management of biological processes and physiology. Provide epidemiological modeling and data analysis to healthcare and military projects. Develop novel modeling approaches to simulate biological and pathological processes, including disease quarantine and extermination. Participate in creation of project and grant proposals with teams ranging from 6 to 24 people. Document results and recommendations through written reports and presentations. Publish findings in internationally recognized medical and scientific journals. M.D. or PhD in biological sciences or related fields. U-to-date knowledge in oncology, epidemiology, and pathology. Minimum 5 years experience in biomedical research. Competence in software development and information management; fluency in C++, Java, HTML, and Pascal. Responsibilities: Manage and coordinate the operation, modification, and encryption of files and programs on neural hardware and networks. Manage uploads and downloads of software to and from neural hardware and networks by means of digital-to-organic interfaces. Modify digital management processes to improve efficiencies and quality. Coordinate, track, and implement neuro-server installation requests, as well as the migration of project resources across platforms. Monitor and troubleshoot neural hardware, software, and networking problems. Provide weekly status reports to the supervisors in Computing and Biological divisions. Master’s degree in Computer Science or minimum 8 years IT experience. Working knowledge of binary-quaternary language translation. Familiarity with multiple operating systems and cross-platform transitions. Responsibilities: Support business teams in analyzing, closing, and funding of commercial transactions. Assist in all aspects of the underwriting process for commercial deals, from initial structuring and pricing through proposal issuance and acceptance to final closing. Perform valuation analysis for projects and companies, and prepare full financial models for project valuation. Conduct financial modeling to determine operating performance and assess risk. Develop strategies to mitigate ongoing risk, including biological, environmental, quantum mechanical, and legal/regulatory threats to MD’s profitability. MBA Degree with 6+ years experience in finance or banking industry with exposure to large commercial transaction underwriting. Experience in financial statement analysis, financial modeling, and valuation. Experience preparing financial information, interpreting financial performance, and assessing risk exposure. Experience preparing and delivering presentations to management and peers. Responsibilities: Manage preparation and delivery of high-quality, nutritious food for MD employees. Prepare breakfast, brunch, lunch, linner, dinner, and snacks for MD employees. Support management team and work with other nutrition staff to deliver "Best in Class" service standards with gourmet quality meals. Implement performance-enhancement and health-monitoring initiatives. Communicate successes and failures effectively with Senior Management while making recommendations for continuous improvement on MD menu. Minimum 3 years experience in multi-unit, high-volume, quality chain or independent restaurant. Minimum 1 year experience with Microsoft Office and POS systems. Massive Dynamic values creativity, ambition, hard work, and integrity. The Massive Dynamic Team Member shares our commitment to the ongoing advancement of humanity, so that every new generation can live longer and better than the last. At Massive Dynamic, we enjoy coming to work, because we know what we do is vitally important to your way of life. Massive Dynamic Team Members are smart... shockingly smart. Ninety-five percent of our employees hold college degrees, and nearly a third have doctorates - in such diverse fields as quantum processing, nanobiology, mammalian psychology, nuclear seismology, biocomputation, cybernetic engineering, ecological strategy, and 4D interior design. The team boasts chess masters, magicians, published poets, graphic novelists, kung fu black belts, and no less than twenty Olympic athletes. Whatever their chosen pursuit, Massive Dynamic people are winners. But you don't have to be a genius to work at Massive Dynamic - just committed to our core values of quality workmanship, technological progress, and community service. Massive Dynamic Team Members enjoy the very best in compensation, benefits, and amenities. As a result, they are some of the most devoted employees in the world. In addition to the standard amenities, our worldwide offices boast five-star restaurants, on-site recreation and swimming facilities, daycare and child development programs, cosmetic centers, yoga and tai chi classes, dental offices, and more. In the future, we plan to add even more facilities, such as auto-hypnosis rooms, revitalization lounges, and detoxification bars. We’re proud to say that people who come to work at Massive Dynamic never want to leave. Our health insurance plans are unmatched in the Fortune 500, with benefits ranging from traditional treatment to mental health to Eastern medicine. In addition, MD employees have privileged access to cutting-edge wellness programs that contribute to the health of both body and mind. A healthy employee is a happy employee. To provide the best quality products and services to improve human existence, to uphold the highest level of scientific excellence and research, and to spread the ideals of human advancement and global citizenship that Massive Dynamic was founded upon. 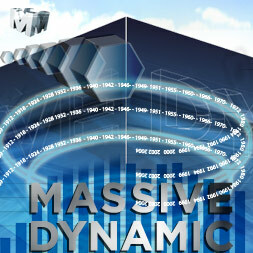 "Massive Dynamic is more than just a company, it is a movement that transforms dreams into reality. And when I dream about the 22nd century, I don't see a distant future, I see what we here are bringing to the present." In 1992, after years of hard work and research, William Bell had finally succeeded in the creating the biomedical marvel that would change the face of medicine and assure his place in science history. His prototype nanoelectronic circuit enabled the translation of neural impulses into electronic data, a major breakthrough in moveable prosthetics. Bell decided the time had come to found a company that would, as he put it, “satisfy the technological needs of this century and the next.” With the backing of a small group of investors, BELLMEDICS was born. Bell's contribution to prosthetics couldn't have come at a better time. The Persian Gulf War had just concluded, and BELLMEDICS gave hope to soldiers who had lost limbs in the conflict. With the support of Defense Department grants, Bell's circuit laid the foundation for a revolution in prosthetics that continues to this day. The firm grew rapidly over the next few years, as BELLMEDICS engineers developed a series of microlaser surgical tools and non-invasive photonic scanners that would become standard at medical facilities around the globe. But for Bell, redefining medicine was only the beginning. Bell partnered with new investors in 1998 to create Fleming-Monroe Aeronautics, which redesigned commercial jet engines from the ground up and soon developed the acclaimed PEARL Aerocontrol System. In 1999, BELLMEDICS acquired Fleming-Monroe and officially changed its name to Massive Dynamic. In 2002, on the 10th anniversary of its founding, Massive Dynamic leapt into the world of computing and telecommunications. Massive Dynamic's Q-Security was widely hailed as a superior, seamless networking tool for governments, firms, and households. MD's Computing and Communications branch grew dramatically, particularly in the fields of artificial intelligence, bio-computation and quantum cryptography. Two years later, Massive Dynamic burst into the world of entertainment. By 2007, Ludic Science – MD's entertainment subsidiary – had designed digital effects software now used by every major film studio. Meanwhile, the Mass-Dyn Z10 videogame console became an overnight hit with children and adults alike, while Giga-Def Televisions took their place in millions of homes around the world. Today, Massive Dynamic is a multi-faceted corporation working for the betterment of medical, communications, energy, transportation, and entertainment technology. As humanity moves boldly into the future, Massive Dynamic will be there leading the way, improving the quality of life for people everywhere. Massive Dynamic: What do we do? What don't we do. 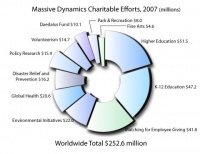 Massive Dynamic's Global Responsibility Report 2007 details our worldwide efforts on behalf of health, safety, education, economic growth and environmental quality. As human civilization approaches the technological singularity, education in math and science will become ever more important. Massive Dynamic is committed to the education of the world’s next generation of biotechnologists, geo-engineers, and neuroprogrammers through our preschool motivational series, primary and secondary enrichment programs, and summer science seminars. High-tech computing is a defining part of modern life. But computer illiteracy threatens to leave whole communities behind. Massive Dynamic believes the digital future belongs to all of humanity, not just the privileged few. Our Computer Literacy Project aims to heal the digital divide, integrating everyone into the bright network of tomorrow. Humanity’s growing demand for energy calls for serious research into remote possibilities. Zero-point energy extraction – the employment of energy contained in a quantum vacuum – holds out the promise of a cheap, clean power source that will make fossil fuels obsolete. Despite the skeptics, Massive Dynamic physicists continue to explore the next frontier in power production, in the hope of creating a greener, more efficient future. As climate change progresses and sea levels gradually rise, coastal regions around the world will face mounting difficulties. Some stretches of land may be lost to humanity forever. Massive Dynamic’s Coastal Protection Project aims to protect coastal areas with advanced technologies including artificial reef construction, sea current rerouting, and hydraulic reclamation. With the right strategies, we can help our beaches resist the rising tide. A happy community is a community where residents feel free to be outdoors. Massive Dynamic believes the best way to support that freedom is by developing clean, pleasant, and safe public spaces. That is why MD has helped to fund over 200 parks and recreation areas in communities across America, and we are looking to do the same worldwide. Did you ever have an idea to help your fellow man, but you didn’t know where to start? Or maybe you thought your idea to solve a problem was too big for you to try alone. Massive Dynamic believes the best ideas originate from the ground up with individuals and communities that want to make a difference. That is why we established the Volunteerism Fund. We provide the start-up funding and trained staff of volunteer experts to help make your plan a reality. At Massive Dynamic, we want to help you help others. As many as half of all birth defects and congenital diseases could be prevented through careful and consistent genetic screening of parents. Sadly, genetic screening remains out of reach for many of the world’s neediest people. Massive Dynamic’s Genetic Screening Fund aims to reduce infant mortality and morbidity by bringing high-quality genetic testing to every country and continent – on the basis of need, not ability to pay. Waistlines are expanding, and more elastic is not the solution. Childhood obesity is more prevalent than ever before. Massive Dynamic’s Better Bodies Initiative aims to fight the growing trend – with nutrition education, community exercise teams, obesity diagnosis centers, and free access to our RealMe product line. Massive Dynamic is committed to helping you become healthier… and happier. When a humanitarian crisis strikes, it’s not enough to send food and supplies to needy people. Without a team of trained and trusted volunteers on the ground to supervise relief, most help goes wasted. Massive Dynamic has trained Crisis Management Teams that accompany all our disaster relief materials into the affected areas. When we send out a helping hand, we want to make sure it finds those most in need. The first 24 hours after a natural disaster are the most critical. Massive Dynamic has identified poor local infrastructure as the leading reason why relief supplies are slow in getting to those most in need. That is why MD is working to reduce the impact of tragedy before it strikes, by helping local communities build roads, buildings, and airports that function before, during, and after a disaster. Almost the entire website is a flash application, and the MD Jingle is a downloadable MP3 (link). On careful study, the tune turned out to be a short piece of the Fibonacci Waltz with harmony added. The company name was originally "Massive Dynamics" (in the online and TV components), but was changed between the leaked Pilot and the official Fox premiere of the TV show; presumably due to trademark issues, or general confusion with the pre-existence of the name in that form. This page was last modified 02:29, 28 April 2012. This page has been accessed 109,675 times.